Looking for exterior home painting ideas? Call today and we will meet with you to discuss your needs and provide a free, detailed proposal afterward. We'll even provide a free color consultation. Meanwhile, you can get some ideas from our color resources or from the images below - real makeovers on real homes. Take the first step today, and find out what CertaPro Painters can do for you! The Albemarle House, former residence of John Kluge, is now part of the Trump Winery and is being converted into a bed and breakfast. Around the exterior of the property, we painted the trimwork. From off white to stark white, the pool house now looks crisp and clean. "Inside" this exterior area, we had the opportunity to freshen things up as well. Attention to detail means even the mullions get painted. Painting in areas like this helps prevent damage to the wood from moisture and weathering, preserving not only the look but also the property value. 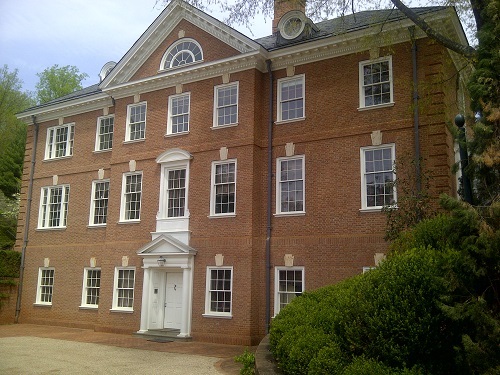 Inside The Albemarle House, we were able to go to work as well. 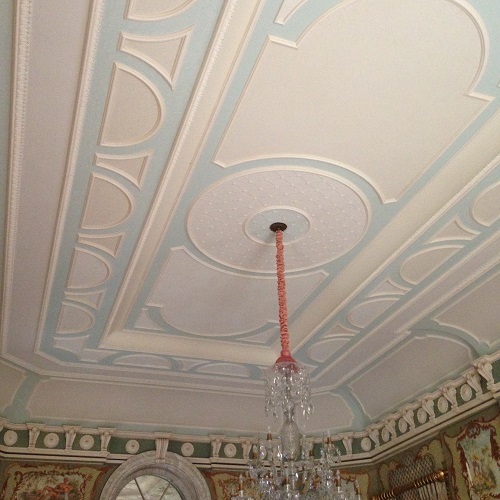 Ornate ceilings require attention to detail to get them right. Wallpaper isn't a problem either, as we can do removal if needed. Sometimes plaster repairs are necessary. Our profesional painting crews can take care of these as well. A simple room, with a simple color scheme - in a house that is anything but simple. Stariwell, hand rails, and faux painting ... all done by your CertaPro Painters team.